Working with an empty room or a blank canvas, if you will, can be intimidating. With so many different design possibilities available to you, it can be tough to come up with an interior design that is eye catching and sophisticated. However, when it comes to the interior design of any room, everything starts with furniture placement. As your residential interior design experts in Miami, we have some tips for arranging your furniture that will help you create a space that is inspiring and unique. Before you start slapping different furniture pieces in your room, decide on a focal point that will be the anchor of your living space. Whether it is a fireplace, a piece of art, or a big, beautiful window, try to arrange the furniture around your focal point to draw the eye and attention in that direction. Once you have chosen your focal point, everything else should seem to easily fall into place. Whatever you do, be sure to avoid lining furniture along the perimeter of a room. This creates a very uninteresting look and feels stagnant. However, we understand that larger furniture pieces may not always fit in the middle of the room, so if you have to line your couch along the wall, try bringing some smaller accent pieces into the room to create movement and interest. Whether it’s a coffee table or an armchair, these smaller pieces will add some balance to your room. When you are arranging furniture in a room, think about what all that room really needs. Does it need a bed? If so, it probably needs some bedside tables and dresser or two. Try to avoid adding too many furniture pieces to a room as this will make it look and feel cluttered. 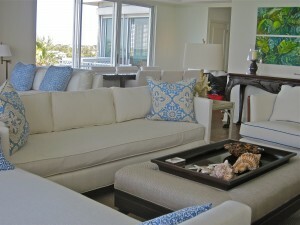 If you want to add a little pizzaz to your room, try adding some stylish accessories like throw pillows and rugs.